This map shows the Town of Milton with current and proposed projects to promote bicycling and outdoors recreation. Printed maps are available at Town Hall, and include additional bicycling information and resources. Click here to download a high resolution PDF copy of the map for printing. Map looks best when printed on 11x17" paper. Note that trails are closed to mountain bikes for the month of March, to minimize erosion during the muddy season. Please use good judgement and ride on-road or on fire roads to prevent erosion when the trails are very wet. Click here do download a high resolution PDF copy of the map for printing. Neponset River Greenway - The Greenway currently extends from the Central Avenue T station at the Milton-Dorchester line out past Pope John Paul II Park in Dorchester. Development work is underway to extend the Greenway west through Mattapan, Milton and Hyde Park, and north along the coast through Boston. Brook Road - Brook Road has designated bike lanes from the new Pierce Middle School to East Milton. Central Avenue - Central Avenue has wide shoulders and is well suited for biking between Pierce Middle School and the Central Ave. Business District. Blue Hills Parkway - The Parkway has wide shoulders and is good for biking between Brook Road and Canton Ave.
Blue Hill Avenue (Route 138) - Blue Hill Ave. has a wide shoulder along the whole length from Canton to Boston, but traffic can move fast (50 mph), residents park in the shoulder, and some of the hills are steep. Truman Parkway - The parts of Truman Parkway in Milton have adequate shoulders, but the Hyde Park section is narrow and may be hazardous. Residents park in the northbound shoulder from Amor Road to Blue Hill Ave. Car traffic generally moves quickly (45 mph). Randolph Avenue (Route 28) - Randolph Ave. north of Chickatawbut Road has fast traffic and narrow shoulders. The south end has fast traffic and wider shoulders. Use at your own risk. Canton Avenue - From Blue Hills Parkway to Route 138, Canton Ave. is narrow, curvy and somewhat hazardous. From Blue Hills Parkway to Reedsdale Road, Canton Ave. is a little more bike-friendly. Brush Hill Road - Brush Hill Road between the Neponset Valley Parkway and Route 138 is very narrow and traffic moves fast. Use at your own risk. But between the Neponset Valley Parkway and Truman Parkway, the ride is nice and there is much less traffic - but the road is still very narrow. Pine Tree Brook - The footpath along the Pine Tree Brook is unpaved but can be handled with a mountain or hybrid bike between Popes Pond and Thatcher Road. Take care not to get pinch flat tires on the sharp ends of the footbridges. Turners Pond - The footpath around Turners Pond can accommodate mountain or hybrid bikes. Blue Hills Reservation - The Blue Hills has hundreds of miles of hiking trails. 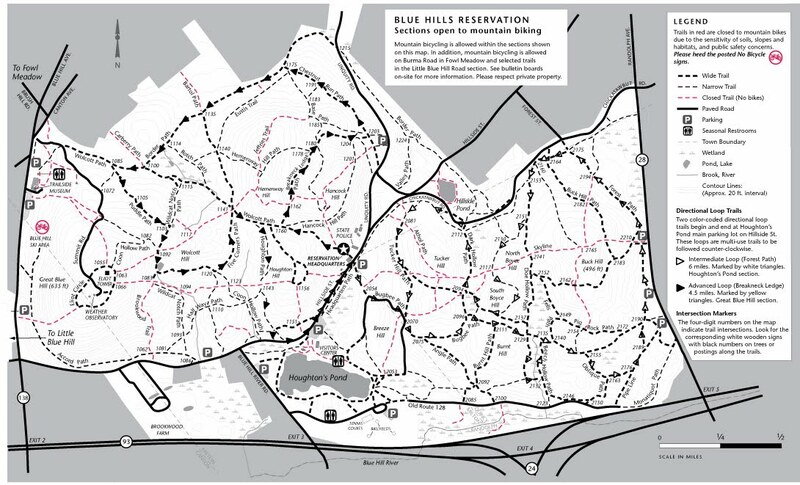 A number of these trails are open to mountain biking, as shown in the DCR map available from the park headquarters on Hillside Street. The roads in the Reservation are also good for road biking, but we recommend them for intermediate to advanced riders as they are somewhat narrow and the hills are steep. Note that the Reservation closes at 8 p.m. and some parking lots and Chickatawbut Road are closed for the night. Trails are closed to mountain biking from January 1 through April 15 to reduce erosion. When biking, wear a helmet, use good judgment, common sense and be aware of your surroundings. Click here for John Allen's Guide to Riding in Boston Traffic. Click here for NEMBA's Mountain Bicyclist's Guide to Responsible Riding. The Milton Bicycle Advisory Committee is not liable for the actions of bicyclists, motorists, dogs, deer, turkeys, raccoons, etc. Please use your own good judgment.